Come and find out why your local Green Party has grown over a thousand percent in a year! 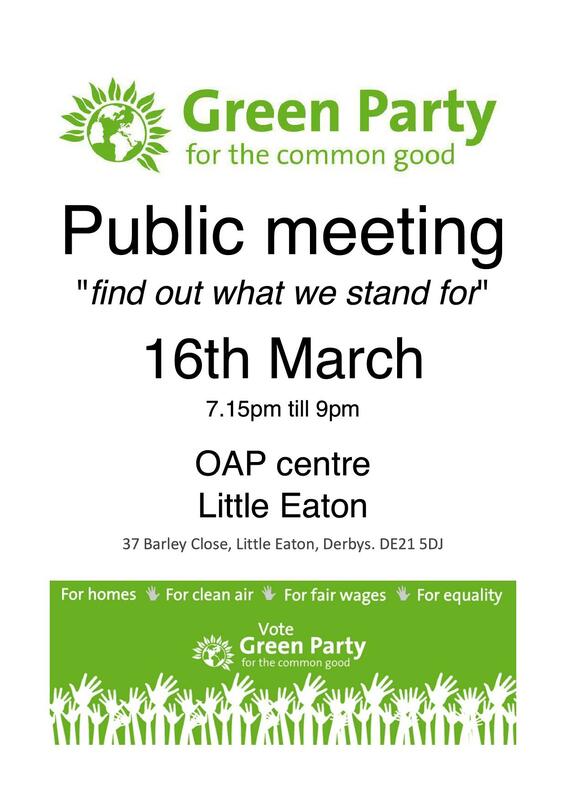 If want to know more about the Green Party, then why not come along to the public meeting of the Mid Derbyshire Greens (Monday, 16th March)? Green Party membership in the Mid Derbyshire and Amber Valley areas has increased by more than 650% since the beginning of last year, with Belper membership seeing a massive 1000% increase (yes, that’s one thousand percent) thanks in part to the increased publicity surrounding the political party. Sue added “Our policies are coming under increased scrutiny and getting a lot of coverage in the media because of the imminent general election and the surge in interest in the party, so we want to give people the chance to chat to us and allow us to answer their questions.”. The meeting is being held at The OAP Centre, 37 Barley Close, Litte Eaton, Derbyshire DE21 5DJ, next Monday, 16th March from 7.15pm – 9pm and is open to absolutely everyone. For more details, please email contact@midderbyshire.greenparty.org.uk . This entry was posted in *Location, Belper & Mid-Derbyshire, Derby, Derbyshire County, East Midlands, Events and tagged Amber Valley, Belper, Belper North, Derbyshire, John Devine, Little Eaton, Mid Derbyshire Green Party, Public Meeting, Sue MacFarlane. Bookmark the permalink.